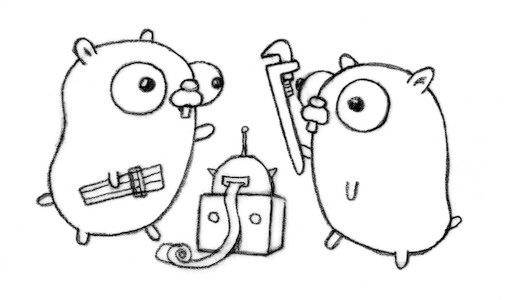 A video of this talk was recorded at GopherCon in Denver. I joined Google and the Go team in February 2010. Had to re-think some of my preconceptions about programming. Let me share what I have learned since. I used to think about classes and types. A Stringer can pretty print itself. Anything that implements String is a Stringer. An io.Reader value emits a stream of binary data. // ByteReader implements an io.Reader that emits a stream of its byte value. By wrapping we compose interface values. Implement complex behavior by composing small pieces. Interfaces separate data from behavior. Copy can't know about the underlying data structures. With embedding we compose types. These are not just cool tricks. This is how we structure programs in Go. 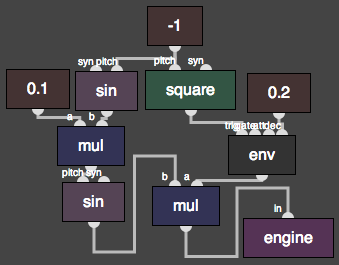 Sigourney is a modular audio synthesizer I wrote in Go. The same API is implemented by the farm and cluster parts of the system. An elegant design that exhibits composition. Interfaces are the generic programming mechanism. This gives all Go code a familiar shape. Interfaces—by design and convention—encourage us to write composable code. and interface values are just values. They are orthogonal to the rest of the language. Better to have many small simple things than one big complex thing. Also: what I thought of as small is pretty big. Some repetition in the small is okay when it benefits "the large". My first exposure to concurrency was in C, Java, and Python. "The performance of an event-driven model without callback hell." But I had questions: "Why can't I wait on or kill a goroutine?" Channels express the communication and synchronization of independent processes. Select enables computation on channel operations. The binary tree comparison exercise from the Go Tour. that compares the contents of two binary trees." a goroutine might be left blocked sending to ch. Add a quit channel to the walker so we can stop it mid-stride. Create a quit channel and pass it to each walker. By closing quit when the Same exits, any running walkers are terminated. Why not just kill the goroutines? Goroutines are invisible to Go code. They can't be killed or waited on. You have to build that yourself. As soon as Go code knows in which thread it runs you get thread-locality. Thread-locality defeats the concurrency model. The model makes concurrent code easy to read and write. This encourages the decomposition of independent computations. The simplicity of the concurrency model makes it flexible. Channels are just values; they fit right into the type system. Goroutines are invisible to Go code; this gives you concurrency anywhere. Concurrency is not just for doing more things faster. It's for writing better code. At first, Go syntax felt a bit inflexible and verbose. It affords few of the conveniences to which I was accustomed. Offer enough sugar to be productive, but not too much. Getters and setters turn assignments and reads into function calls. This leads to surprising hidden behavior. In Go, just write (and call) the methods. The control flow cannot be obscured. Map/filter/reduce/zip are useful in Python. In Go, you just write the loops. but makes the performance characteristics obvious. It's easy code to write, and you get more control. Go functions can't have optional arguments. Or a variadic list of options. Create many small simple things, not one big complex thing. The language resists convoluted code. With obvious control flow, it's easy to navigate unfamiliar code. Instead we create more small things that are easy to document and understand. So Go code is easy to read. I was often too clever for my own good. I appreciate the consistency, clarity, and transparency of Go code. I sometimes miss the conveniences, but rarely. I had previously used exceptions to handle errors. Go's error handling model felt verbose by comparison. Error values are used just like any other value. Error handling code is just code. Go makes error handling as important as any other code. (interfaces, channels, and so on). Result: Go code handles errors correctly and elegantly. We use the same language for errors as everything else. Lack of hidden control flow (throw/try/catch/finally) improves readability. To write good code we must think about errors. Exceptions make it easy to avoid thinking about errors. 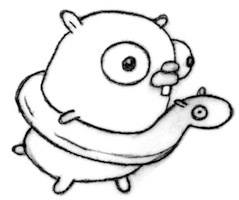 Go encourages us to consider every error condition. My Go programs are far more robust than my programs in other languages. I don't miss exceptions at all. "Let me use my own naming scheme!" "Let me use my own structure!" I was disappointed by lack of monkey patching. 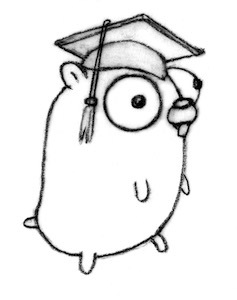 Go packages are a name space for types, functions, variables, and constants. Visibility is at the package level. Names are "exported" when they begin with a capital letter. Good for readability: easy to see whether a name is part of the public interface. Good for design: couples naming decisions with interface decisions. Packages can be spread across multiple files. Permits shared private implementation and informal code organization. Packages files must live in a directory unique to the package. The path to that directory determines the package's import path. The build system locates dependencies from the source alone. Go forbids modifying package declarations from outside the package. This gives the flexibility of monkey patching but on the package author's terms. The loose organization of packages lets us write and refactor code quickly. But packages encourage the programmer to consider the public interface. This leads to good names and simpler interfaces. there are no makefiles to get out of sync. Predictable semantics make packages easy to read, understand, and use. Go's package system taught me to prioritize the consumer of my code. It also stopped me from doing gross stuff. Packages are rigid where it matters, and loose where it doesn't. Probably my favorite part of the language. Godoc reads documentation from Go source code, like pydoc or javadoc. But unlike those two, it doesn't support complex formatting or other meta data. // Join concatenates the elements of a to create a single string. 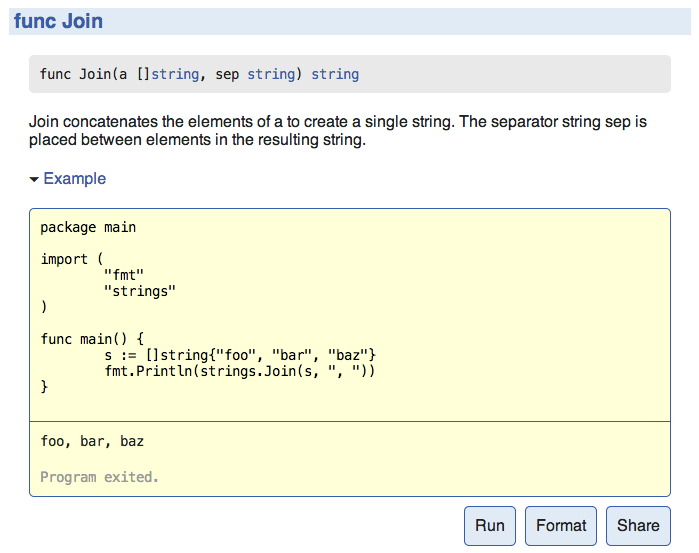 separator string sep is placed between elements in the resulting string. Also integrated with the testing framework to provide testable example functions. // ValidMove reports whether the specified move is valid. * Validates a chess move. Godoc taught me to write documentation as I code. Writing documentation improves the code I write. At first, something seemed weird or lacking. I realized it was a design decision. Those decisions make the language—and Go code—better. Sometimes you have to live with the language a while to see it. New features can weaken existing features. Orthogonality is vital: it enables composition. Don't solve problems by building a thing. Instead, combine simple tools and compose them. Invest the time to find the simple solution. These lessons were all things I already "knew". Go helped me internalize them. 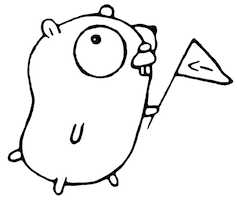 Go made me a better programmer. Let's build small, simple, and beautiful things together.